in that screen capture and blog post I walked through a demo of code where I was using AllJoyn in Windows 10 across desktop/phone and IoT devices (Raspberry PI 2 in my case). If the app is running on a non Windows IoT device then the interface just changes the colour of a path on screen. If the app is running on a Windows IoT device then it will additionally attempt to light up a real LED. I showed that working in the previous video and the code is all available for it on the blog post. At the time though, what I really wanted to do was to control it with Cortana but I didn’t have Cortana working on my PC at the time that I wrote that post. A user should be able to ask Cortana to show all the lightbulbs that ‘she’ can see. A user should be able to ask Cortana to turn on/off lightbulbs. I thought it might be a fun thing to play with and I could certainly see some future scenario of shouting at the XBOX One to turn the lights on outside or similar. Everything I write here builds on the previous post and so I wouldn’t expect this to make any sense if you haven’t seen that post and I’m only going to write up the additional pieces here rather than run through the whole thing again. and so now my interface encapsulates the idea of asking the lightbulb where it is located and whether it is already on/off. I then re-worked my 2 implementations of a lightbulb in order to implement these additional pieces of functionality but it’s just a small amount of extra code in each case. Because my Raspberry PI doesn’t usually have a keyboard plugged in, I added some IoT Core specific code to set a timer such 5 seconds after startup it will act as though the button has been pressed and will go ahead and set the location of that lightbulb to be ‘kitchen’. Cheap and cheerful! Beyond that, I didn’t make many (or probably) any mods to the code that I’d had in the previous post acting as a lightbulb service. 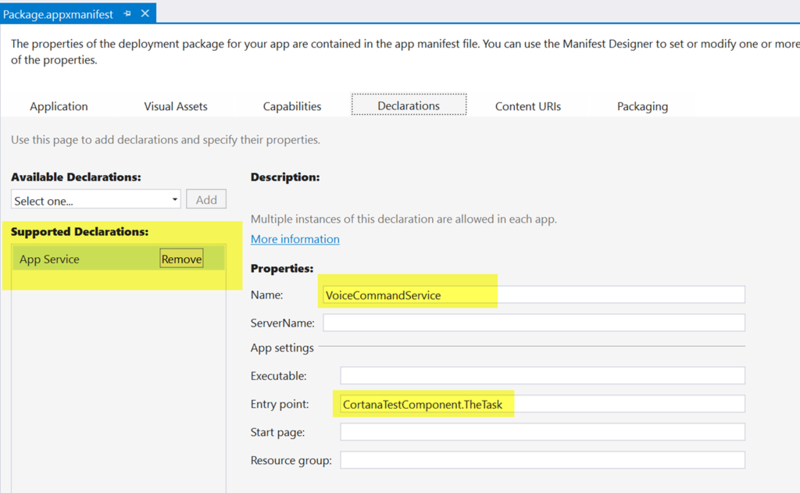 Voice commands being used to launch the foreground UI of an app and steer it to navigate to particular content. 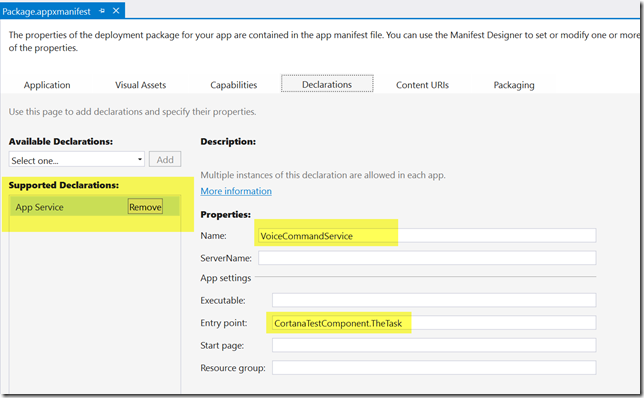 Voice commands being used to speak to a background service of an app and steer it to perform specific tasks with UI hosted on Cortana’s own canvas. I focused entirely on (2) here and so my app is made up of 2 projects – a blank UWP app and a Windows Runtime Component to host my background task. 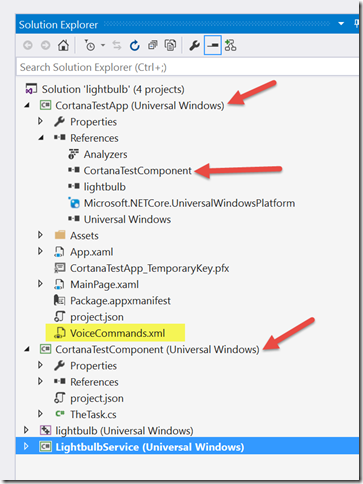 I made the UWP app reference the component project so that the bits get copied over at build time. and I’ll admit that I find it very odd that for this particular type of background task there’s no need (AFAIK) to write registration code to register the background task on a trigger. It just ‘exists’. Receive a voice command from Cortana like ‘show all the lights’. Execute a query to find all the lightbulb services on the network. Format the results back to Cortana. 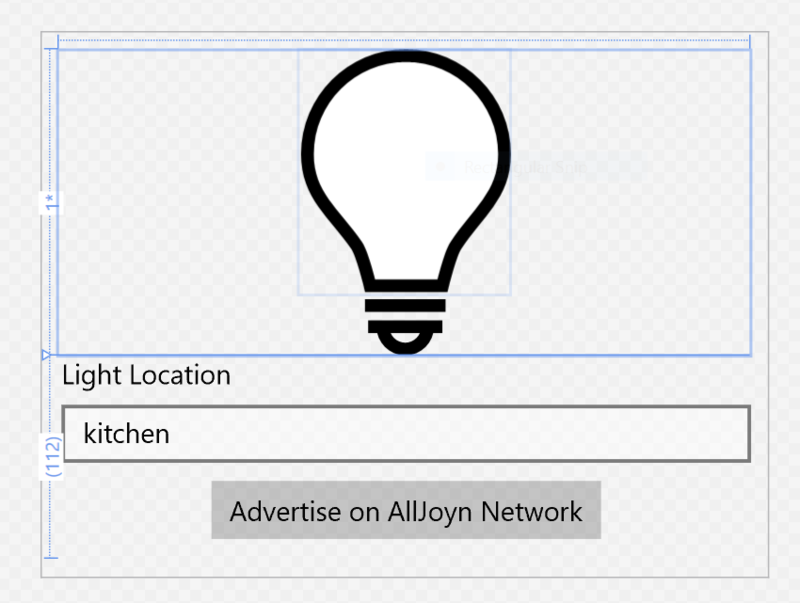 However…the class that I get generated from the AllJoyn interface is a lightbulbWatcher class and what it knows how to do is to wait around for lightbulb services to show up on the network. What it doesn’t seem to be particularly set up to do is to get me all of the lightbulbs that are on the network at a specific point in time. Meanwhile, Cortana is a demanding client – she’s not going to hang around for ever while I build a list of lightbulbs. 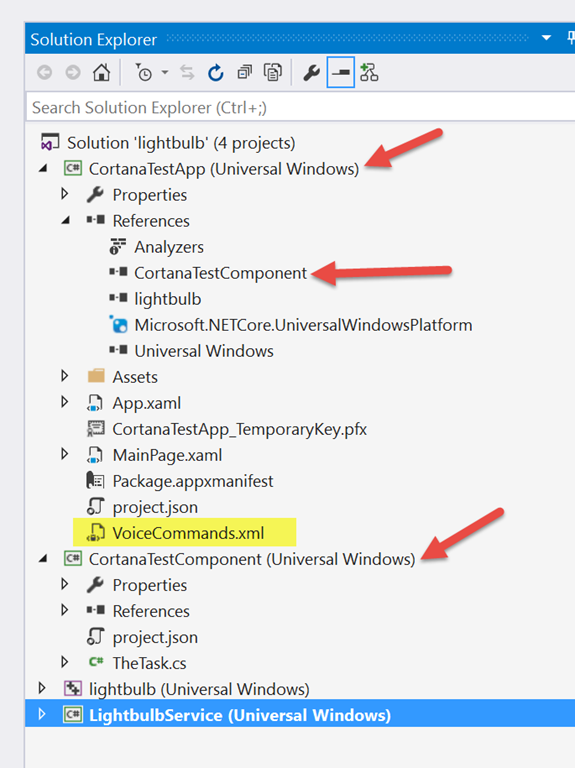 When a voice command arrives at my background task, I construct a lightbulb watcher and ask it to look for lightbulbs. Meanwhile, I set about waiting for a 10 second delay and I stop watching for lightbulb arrivals after that 10 seconds has elapsed. So far, this seems to work reasonably well but I don’t know whether it’d scale to 10-100 instances of the service on a slower network. I create a lightbulb watcher and wait around for up to 10 seconds for lightbulb instances to be discovered. I put some details about that lightbulb onto a list. Communicating with a specific lightbulb to turn it on/off. In my original implementation, I assumed that at step 3.2 above, I could get rid of the lightbulb service consumer and recreate it at step 4.2 if needed. However, I found that my attempts to do this were met with ‘you have already joined this AllJoyn session’ type errors and so in the end I keep around all the consumers from step 3.2 until step 4 is entirely finished and then I release them all. // sure that we factor in cancellation. // the list remains null, we got cancelled. and, clearly, some of this (particularly the message dialogs back to Cortana) could be encapsulated into some additional classes to make the code better all round but this was coded somewhat ‘on the hoof’. I found it an interesting thing to experiment with though and I could definitely see this sort of idea being built into apps such that I can control devices around the house through home automation. I’m fairly certain that companies like Insteon are doing work with both AllJoyn and Cortana so I’m sure it’s something that we’re going to see a lot more of. If you want the code for all of this (warts and all!) then download from here.